Today is Chinese New Year - and 2019 is Year of the Pig. 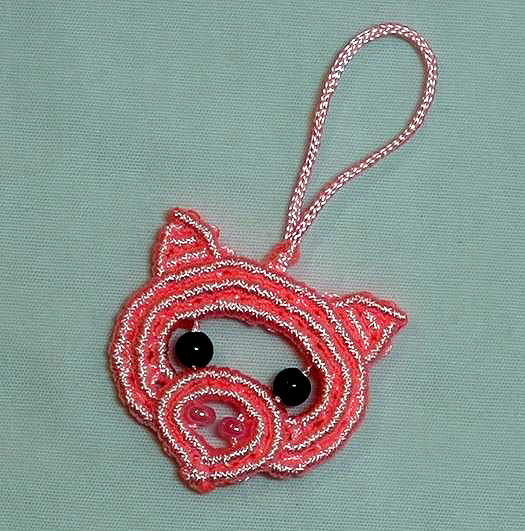 Look at this cute piggy key chain (or pendant if you wish)! It sure will attract luck this year! Have a Happy New Year, my macrame friends! 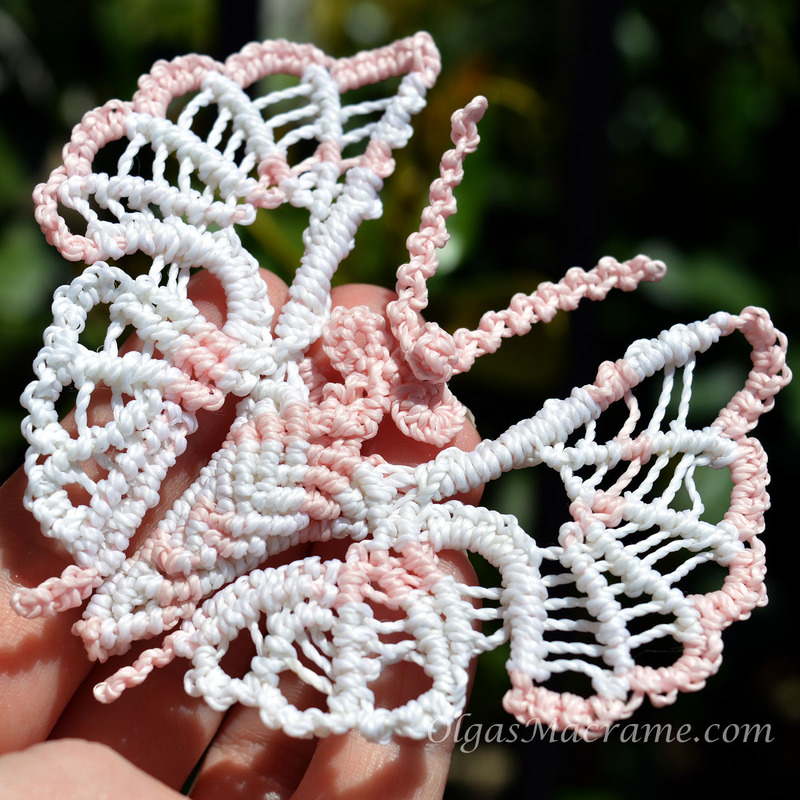 I'm very happy to announce a new tutorial on this website - Macrame Lace Doily! 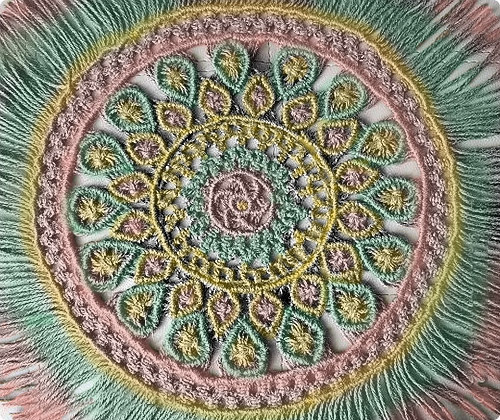 I've been getting a lot of requests to make a tutorial for these Macrame mandalas, and finally I had some time to complete it. There are a lot of steps, but don't let it discourage you - the project might be lengthy and seems complicated, but it is actually pretty easy and uses only several common Macrame knots. 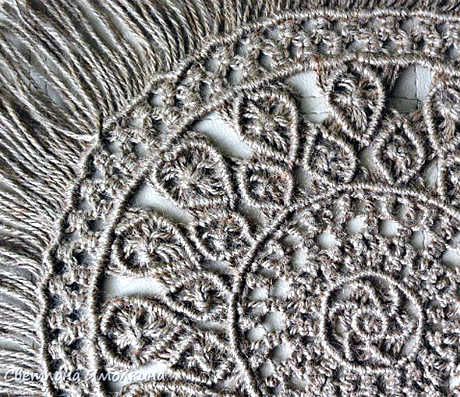 The outcome will be a beautiful lace-like doily for your home, or you can use this pattern to make a round wall hanger - dreamcatcher style! Buddhists say that mandalas, or circle designs like this one, transmit positive energies to the environment and to the people who view them. They are believed to purify a soul and heal a body. I don't know about that, but they certainly look good on a table or on a wall. Good luck with your project! For some reason I just love the leaves and twigs pattern and wanted to make one myself for a while. Finally I made it. Not perfect, but I like it!! 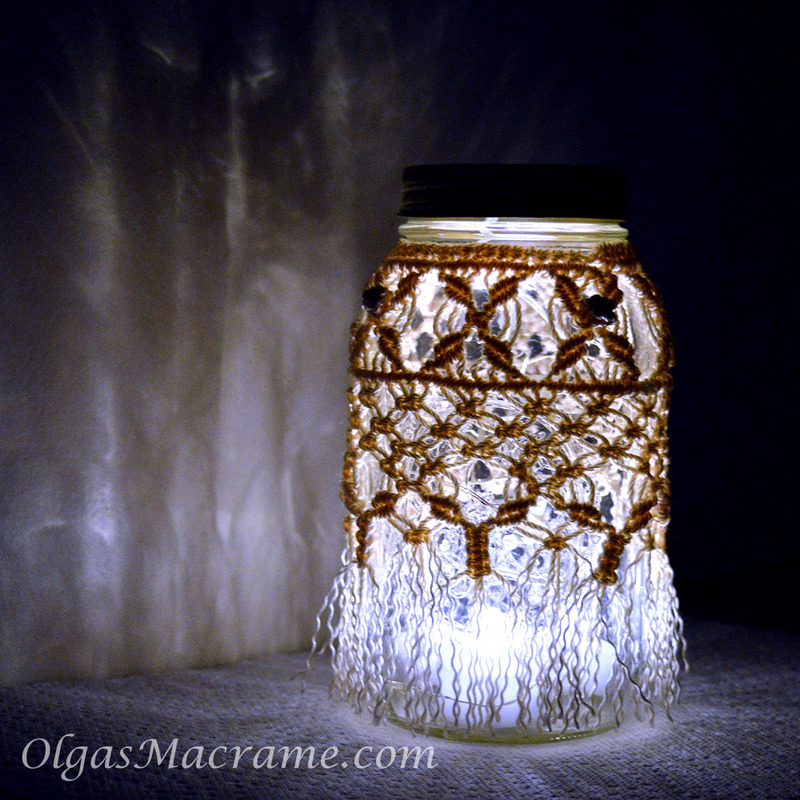 Macrame a Fairy Night light! ..Just turn on the fairy lights, turn off the lights and relax - you worked hard today! Valentine's Day is less than 2 weeks away, time to prepare those valentines! 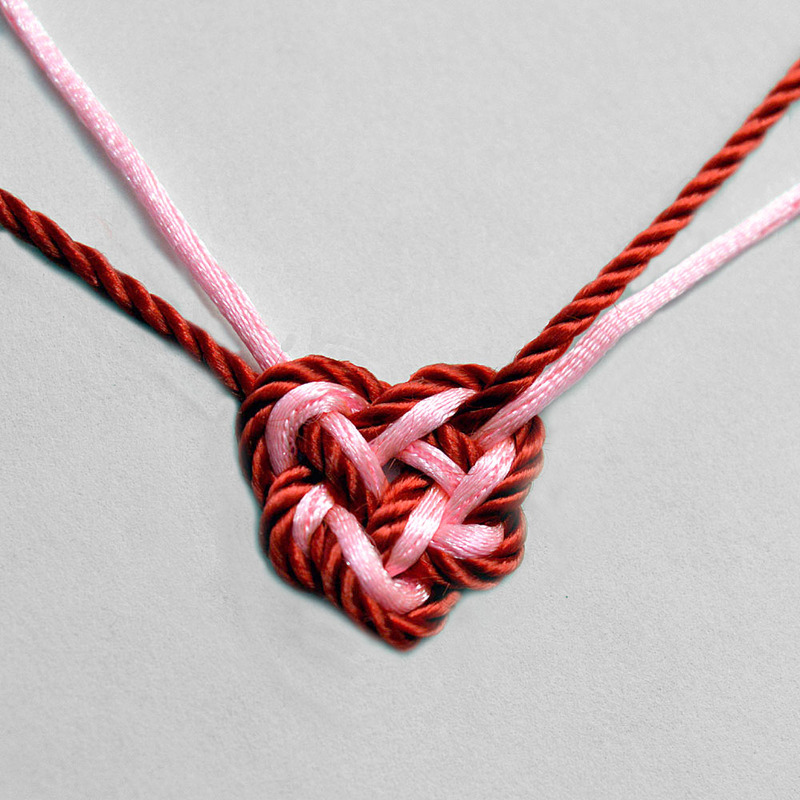 I just made this easy Macrame Heart knot necklace using red and pink cords. 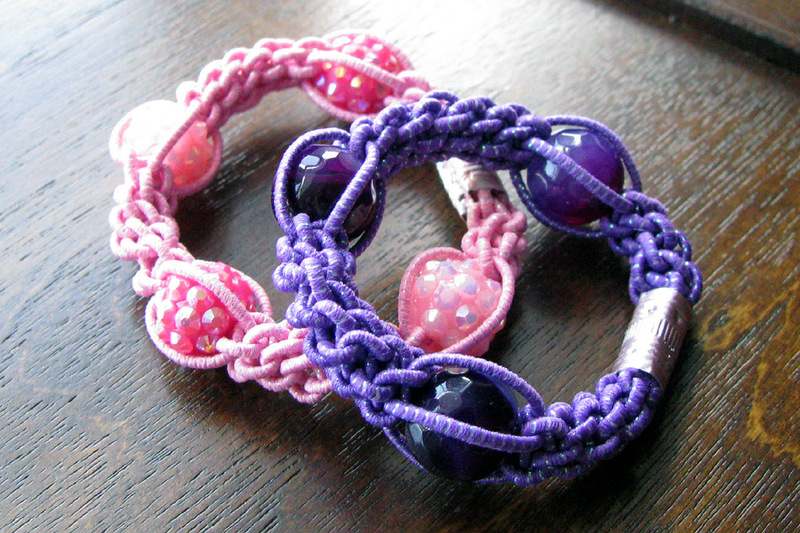 Here is a link to very helpful Macrame Heart knot tutorial. 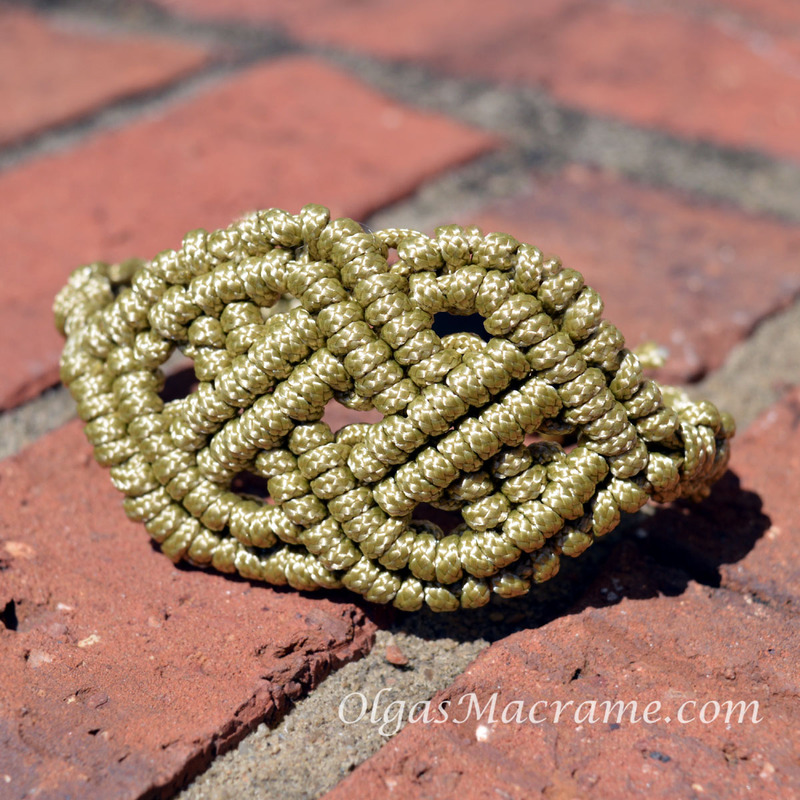 This knot can be used to make a cool Macrame key chain too! Read more: Bless your Heart! Snowflake Earrings tutorial is ready! Hello and Happy new year! 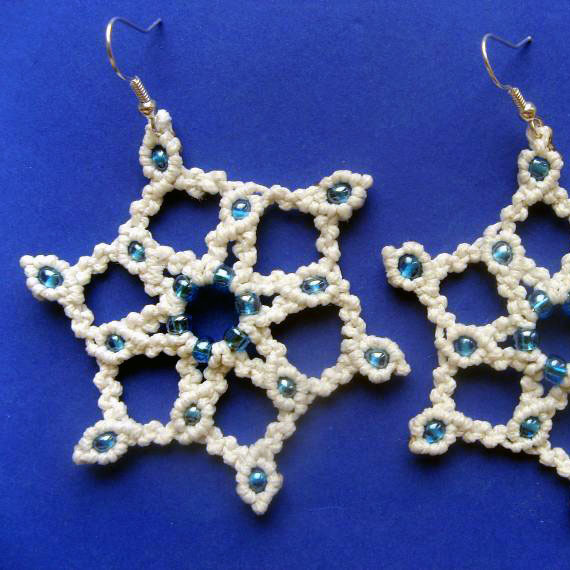 Please check out my new Macrame Snowflake Earrings tutorial! 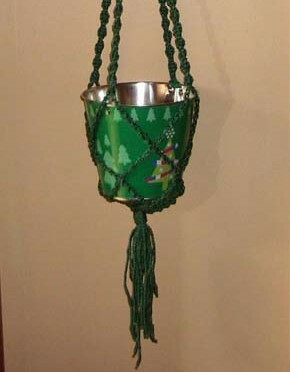 Special thanks to macrame master Julia Titarenko for the pattern. 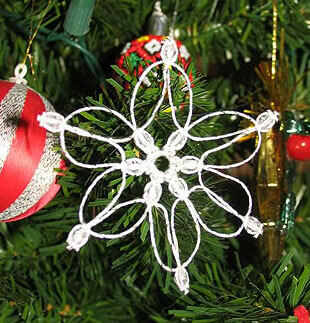 It's great because it's versatile - you can use this instructions to make not just earrings, but a Snowflake pendant, Christmas snowflake ornament, Macrame Snowflake key chain, and even a Snowflake hair clip! Have fun knotting! Happy holiday season, dear friends! 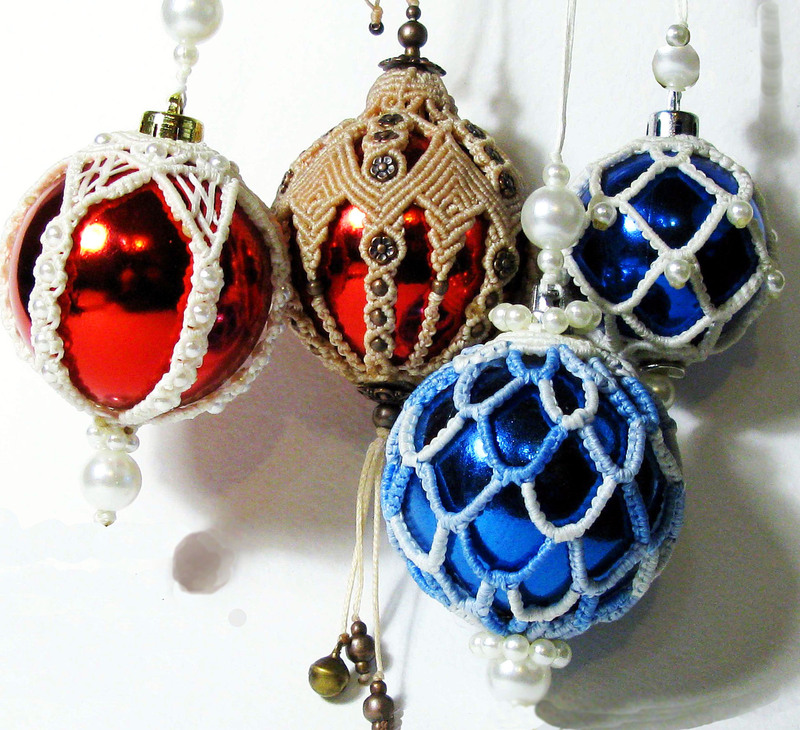 Of course, every macra-maker should have a Macrame ornament on their Christmas tree. I've seen so many ideas for wonderful Christmas tree decor online, but my favorite are those from AlexArt. I'm in love with these scalloped lace designs!! 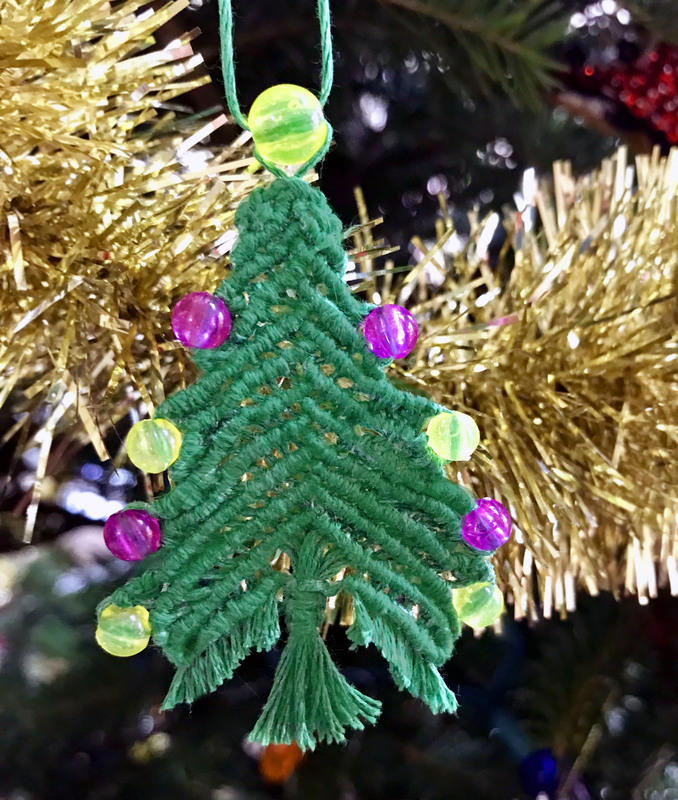 They inspired me on making some of the decorations myself, and I'm gladly sharing the Macrame Christmas Ornament tutorial with you! Hello, friends! 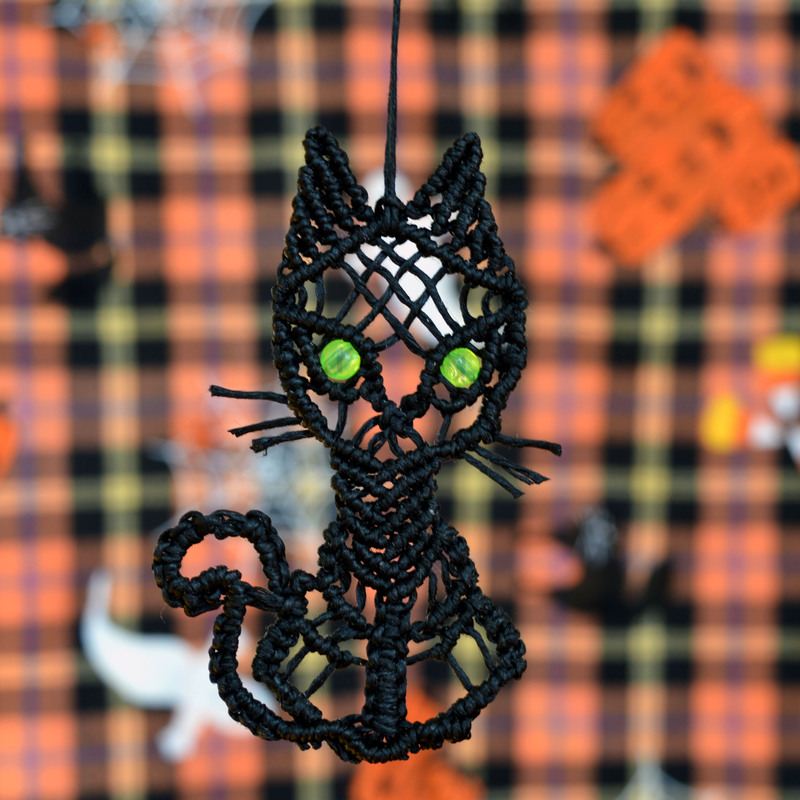 I just made this Macrame Halloween kitty. Named him Spooky!)) Although I think it turned out not spooky, but mysterious.. I used a pattern from this my Macrame cat tutorial, just used black threads instead of orange. Read more: Round and round we go! I would like to congratulate all my website visitors with the Independance Day (even if they don't live in the USA - I wish you a wonderful day!). 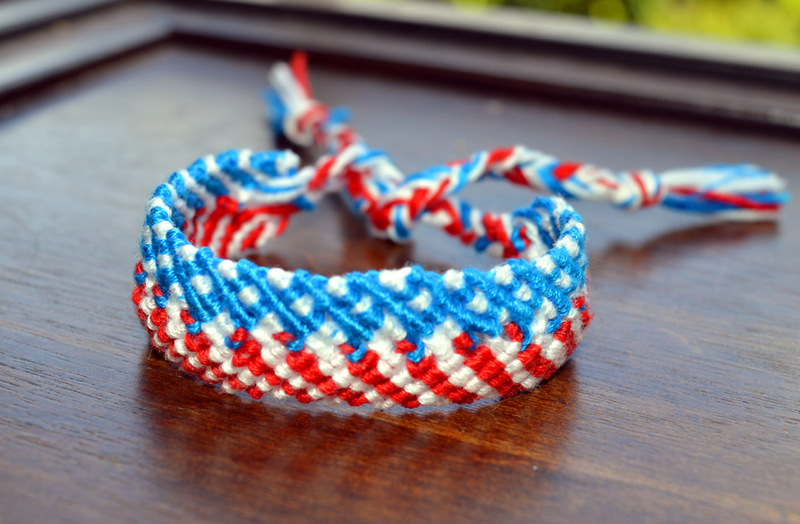 This Macrame 4th of July Bracelet is just in time for the holiday! 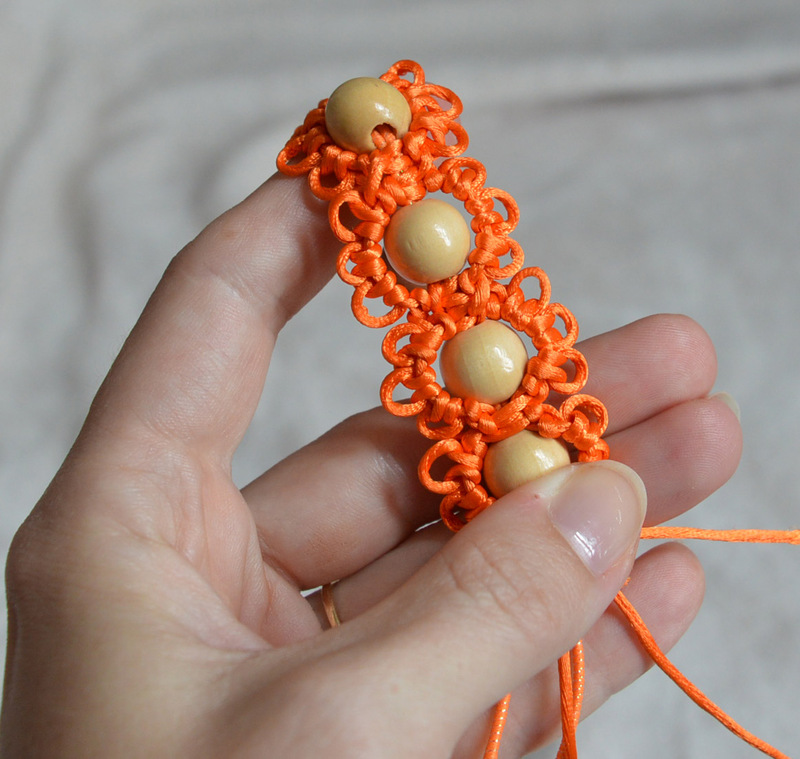 I'm still putting the tutorial for this Macrame bracelet together - please forgive me for the wait.. But it is fairly easy to make and you can show off your pride on the future holidays, or just because! Happy International Womens Day, ladies! And Happy spring! 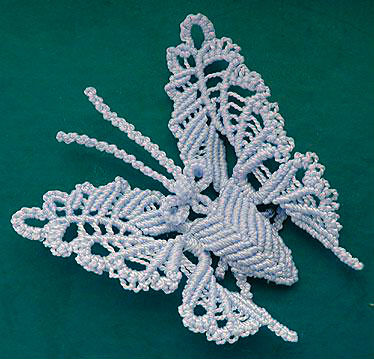 Let's celebrate this wonderful holiday and beautiful season with these Macrame flowers! 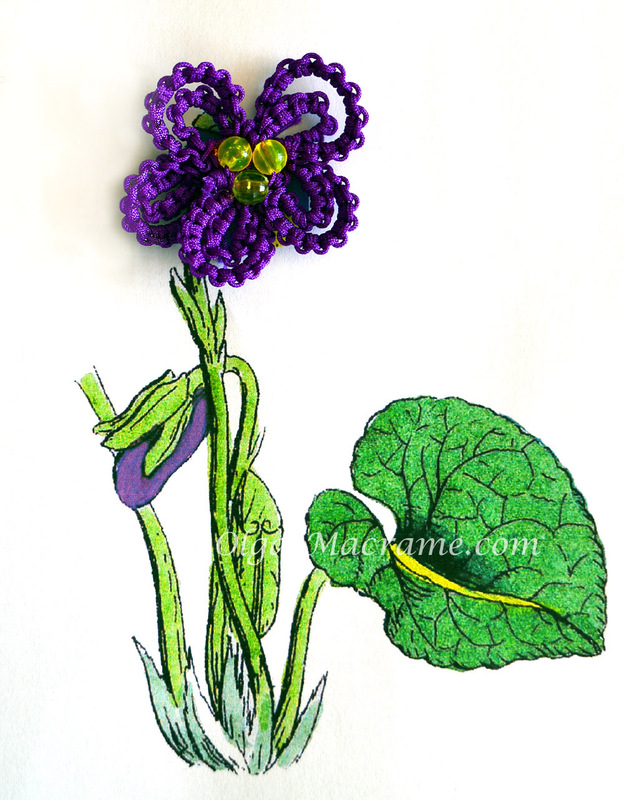 One of my favourite spring blooms are violets - so, I made these very easy Macrame Violets.. Hope you like them! 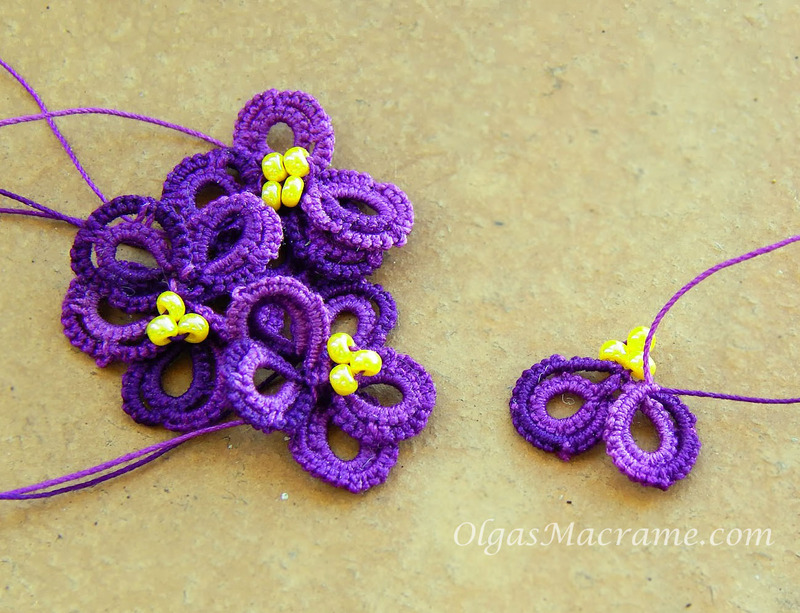 If you would want to make them yourself - the new Macrame Violet Flower tutorial is coming soon. What will you give this year to your special "valentine(s)"? A heart? A rose? What about both?? You can call it a Hearty Rose or a Rosy Heart - in any case, it will make your loved ones very happy! Attach it to a gift as a decoration, use it as a brooch, a hair clip or a pendant... The Valentine's Day Heart/Rose tutorial is in working progress! Read more: Valentine's Day tutorial - Hearts or Roses? Wishing you a season of joy, season of cheer, and to top it all off - have a wonderful, creative year!! Ok, it's October already - and Halloween time! I always wanted to make a Macrame Bat, but I couldn't find any tutorial for the it on Internet, so I decided to create the pattern myself. Hope you like it! It can be used as a pin, earrings or a pendant, like on the picture below (many thanks to my daughter for posing patiently! 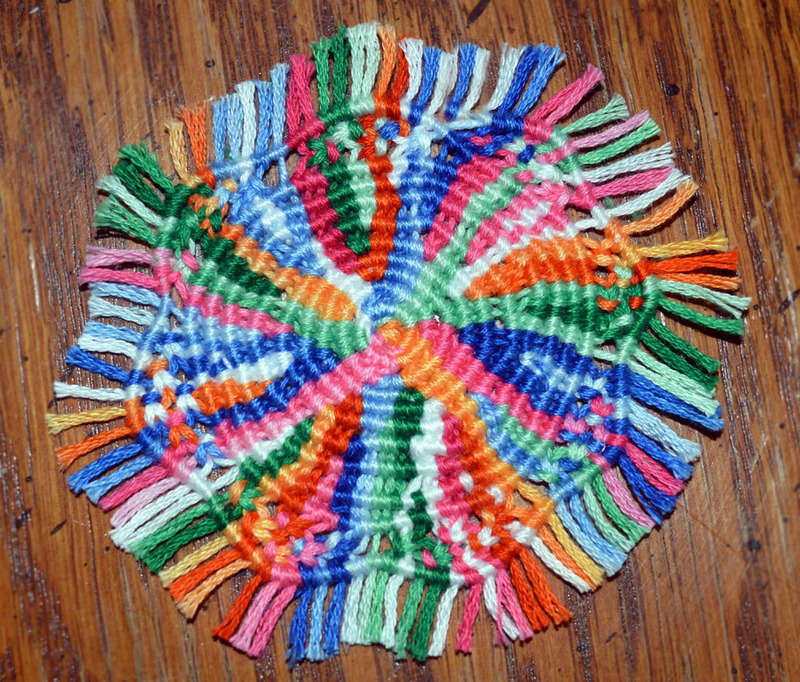 ), or even as a home decor, if you use thick thread. If you made my Macrame Butterfly, then this Macrame Bat will be easy project for you, because I used many details from that tutorial.. 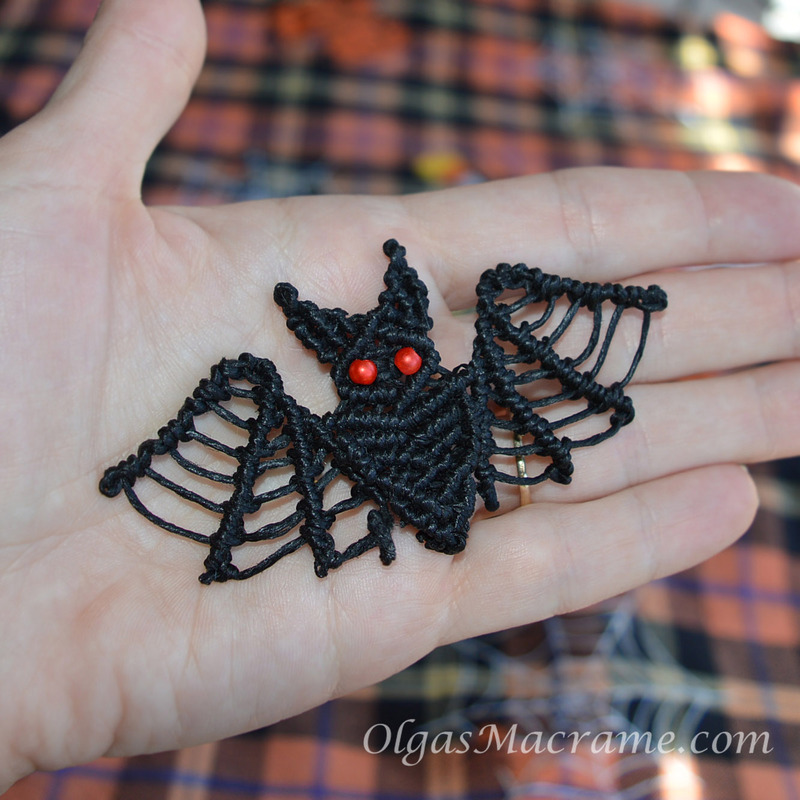 I'm working on the Macrame Bat tutorial page now, so bookmark the page! 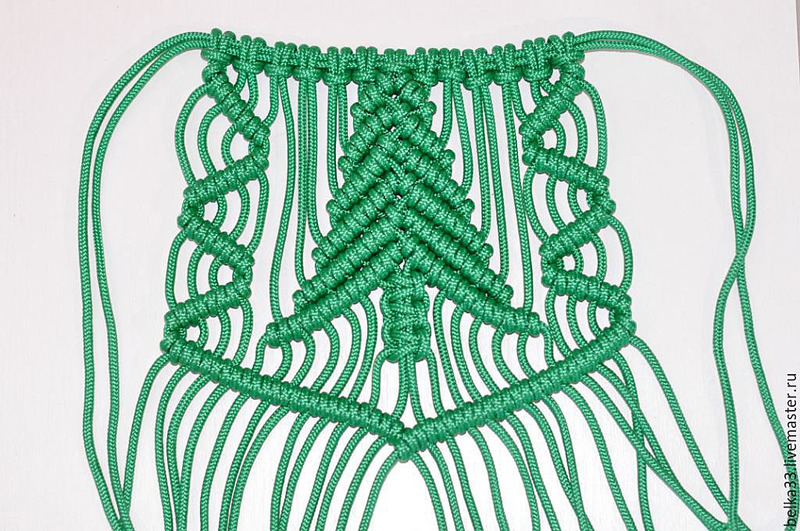 Read more: Let's Macrame for Halloween! 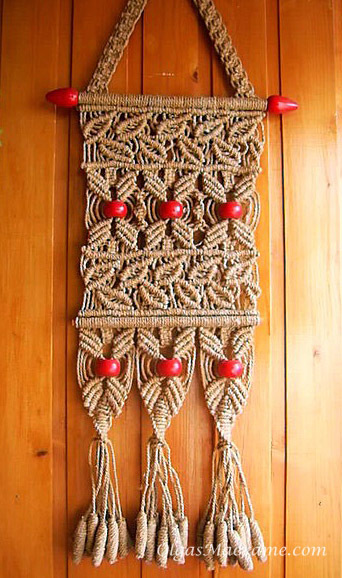 This Macrame wall hanging, with its falling "leaves" and ripe red "berries", is perfect for fall decor! And it is so much fun to make.. 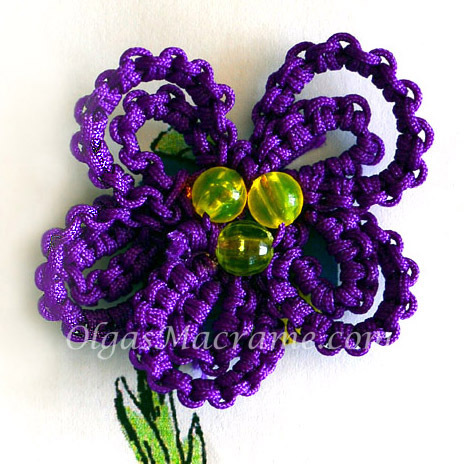 UPDATED The Macrame flower bracelet tutorial is completed! Summer is almost over - but i don't want to let it go! Maybe that is why I keep making these bright and sunny Flower bracelets! They are stretchy - I don't really like bracelet's closures, they are so uncomfortable! Much easier just to slip the bracelet on. For this piece of jewelry I used silk thread and matching elastic thread for base (and some painted wooden beads). There are just two types of knots - the Square knot and the Frivolite knot. Working on detailed tutorial now! 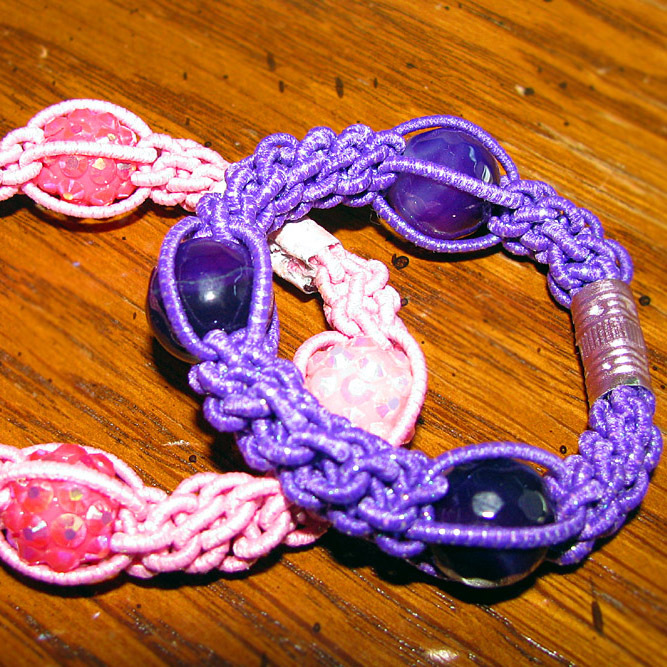 Here is my new obsession - Macrame hair elastic ties, which also can be used as stretch bracelets. I saw them once on Internet and loved the idea! 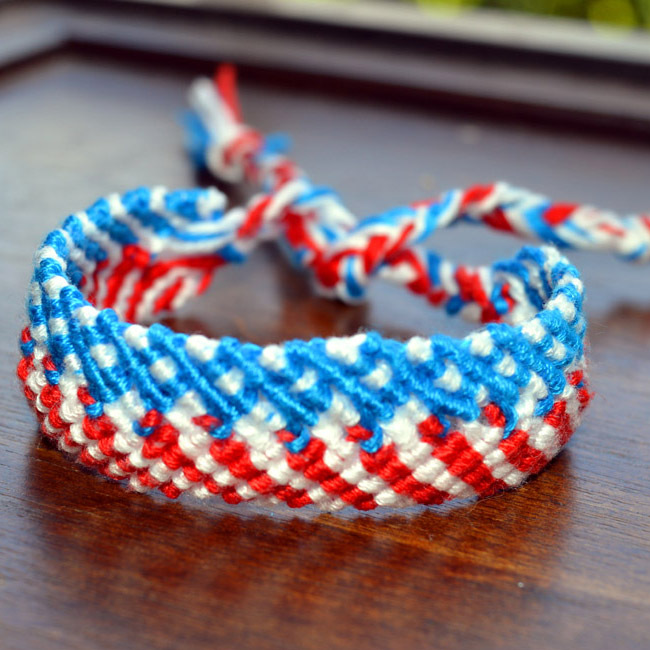 You only need elastic thread and beads, and they are so easy to make. Me and my daughter love wearing them both in hair and on hand! Detailed instructions coming soon.. Check out my new tutorial - Macrame Hammock step by step instructions! What can be better on a hot summer day than relaxing in a comfortable Macrame hammock, that you've made yourself? You deserved to be pampered! 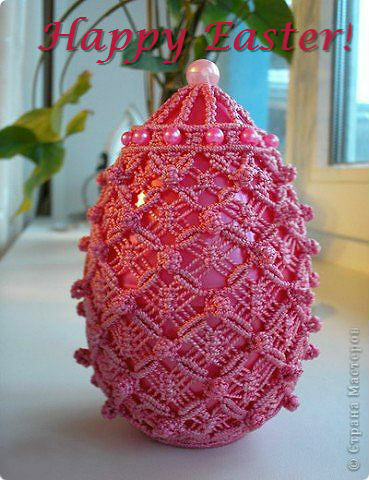 The design belongs to macrame master Antonina Kulikova from makrame-shop.ru and has lots of extras, that are optional. 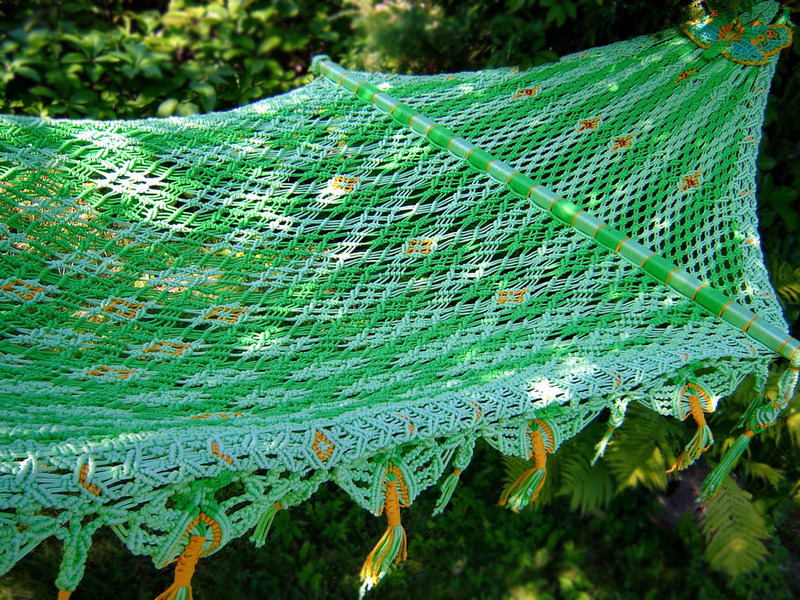 The main pattern of the Macrame hammock is actually not too hard to recreate. Are you ready for the challenge? Want to be the trendiest girl at the beach/pool this summer? Get yourself a swimming suit with Macrame detailing! Here is my top 10 favorites. 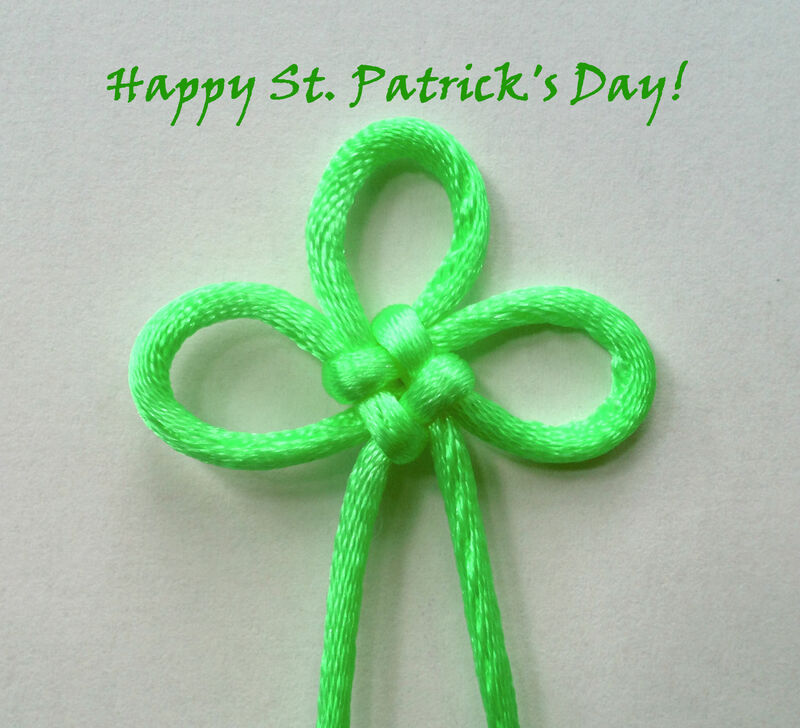 I just hope they are as comfortable as they are pretty..
A knot of the day is Clover Leaf! 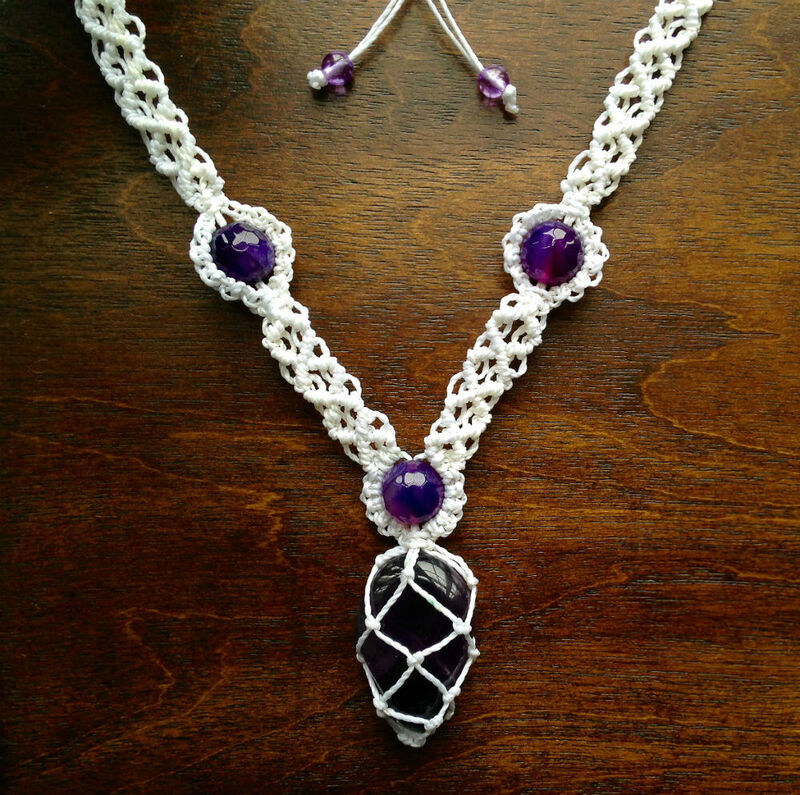 Welcome to my new tutorial on how to make a Macrame Necklace with a gemstone and beads. I enjoyed making it - and I hope you will enjoy it as well! Happy Chinese New Year - the Year of the Monkey! 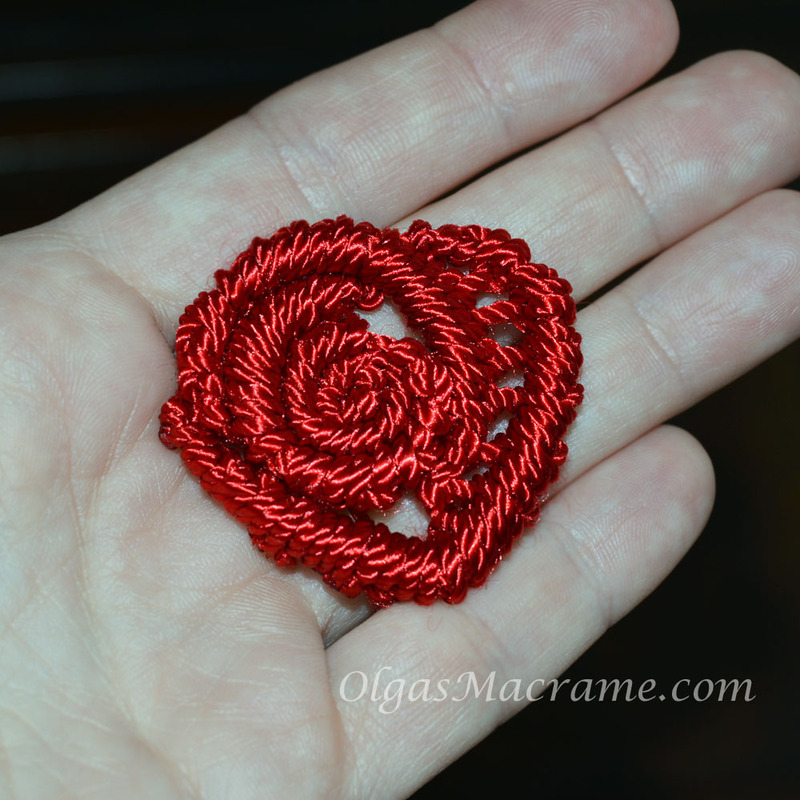 Give your Valentine the Macrame Heart! 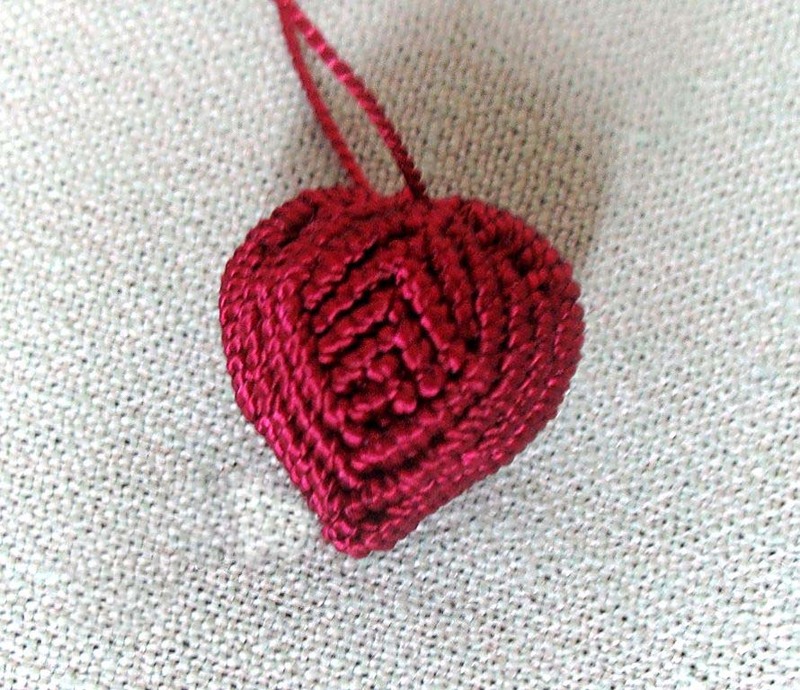 This is a great way to show your love and appreciation - present this DIY Macrame Heart. Your loved one can use it as a keyfob, a charm or even a pendant! Happy Valentine's day! I saw this picture of beautiful baby bassinet on some social network website and just had to share! Unfortunately I was unable to locate the author, but he or she sure is very talented! Wishing to all the crafty people out there a wonderful year ahead, filled with bright ideas, inspiration and great achievements! Be knotty - and nice! Happy New Year! Crafty people never forget about their hobbies - even celebrating a holiday. Look what you can do with the champagne or wine bottles left after New Year Eve party! 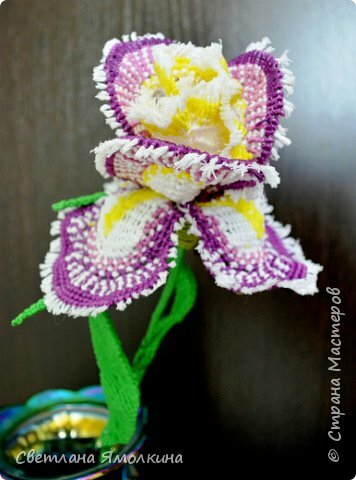 These amazing - or more like MACRAMEzing - flowers were created by a talented crafter from Russia Svetlana Yamolkina. When it is winter outside, isn't it nice to enjoy a view of this pretty spring blooms? It warms me up inside!! Hope you will enjoy them too. 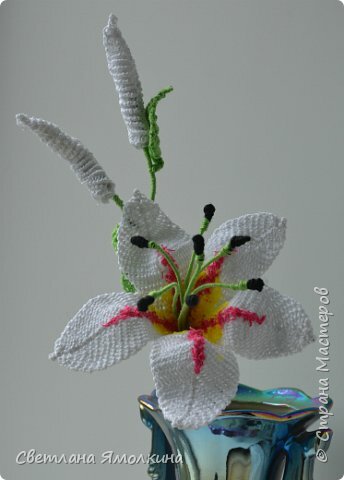 Let me know in comments if you would like to see a full tutorial for these Macrame flowers. 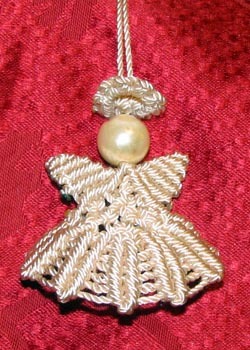 Just added a new pattern for Christmas - Macrame Snowflake ornament. This project is suitable for beginners and kids. 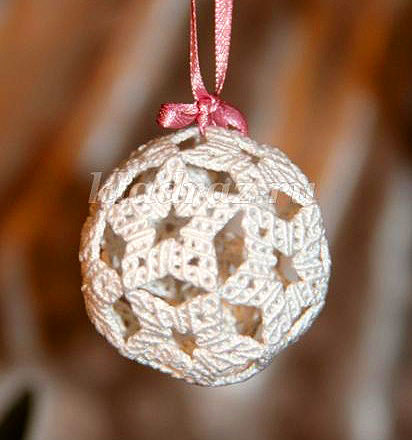 The Macrame Snowflake is great as a stocking stuffer or as a last minute Christmas gift. Check it out! 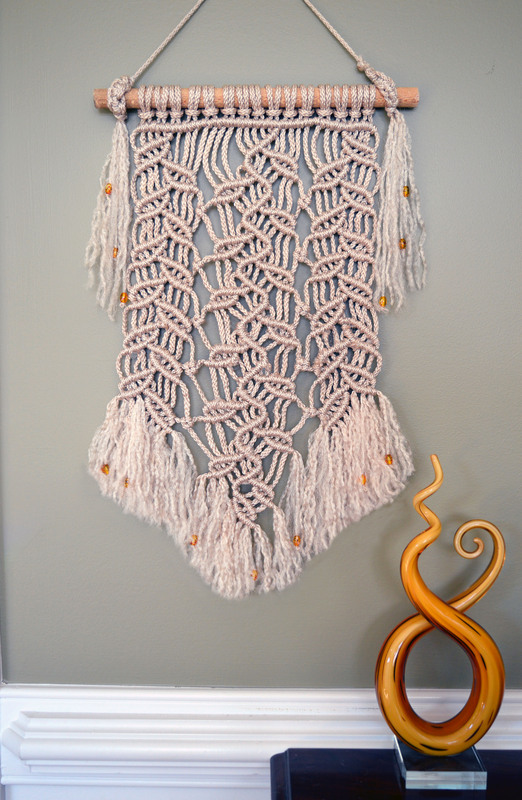 This is an easy and pretty macrame project - Macrame plant hanger. It fits a pot around 4-7 inches in diameter. This plant hanger will look great in any interior! 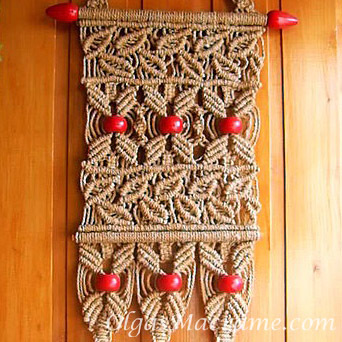 Click here for detailed step by step instruction for this Macrame plant hanger.